Editing photos is one of the key parts of any photographer’s workflow. But it can also be one of the more frustrating parts, because photo editing software tends to be resource hungry. This means you need the right tool for the job. Whilst a high powered desktop is often the tool of choice, this isn’t going to work for everyone. This is especially the case if you travel a lot, or just want something that you can take to a coffee shop for some work. With this in mind, I wanted to put together a guide to the best laptops for photo editing. I will cover a range of laptops with a variety of capabilities suitable for a wide range of budgets. There are a number of factors to consider when picking a laptop for photo editing, and I’ll cover each of these factors in detail. Then I’ll provide a list of the best laptops for photo editing across a variety of budgets. Editing photos takes a powerful computer. 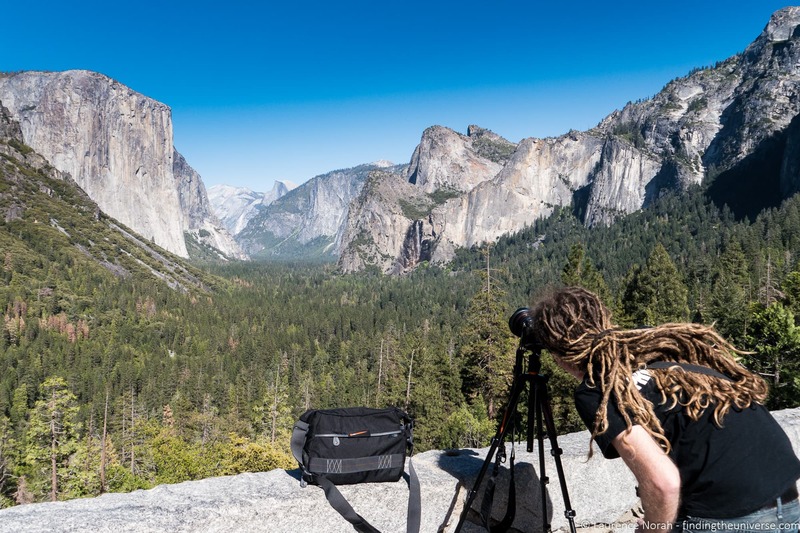 This is especially the case if you are shooting in RAW, as the large amount of data you have to process can be a real workout for a processor, and the laptop system as a whole. It’s important therefore that you know which components are the most important in terms of improving photo editing speed. I also know that computer terminology can be as opaque as photography terminology, and companies love to throw around marketing buzzwords to make products seem appealing. Luckily, I have a degree in computer science and have been taking photos since 1993, so hopefully I can help you make sense of all this. 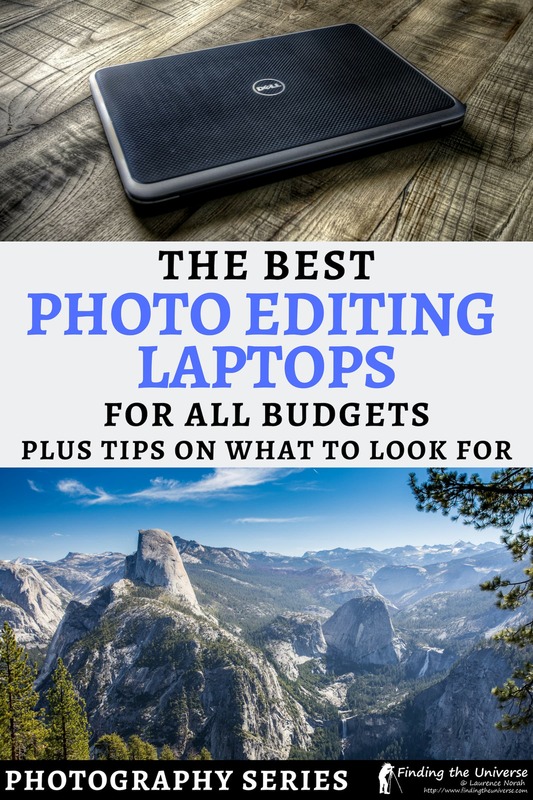 To help you out, I’m going to go through all the key specifications you need to be looking for when shopping for a photo editing laptop, why they are important, and the ideal specification you should be looking for. These specifications will also work for other types of creative work that require a lot of computing power, such as a laptop for video editing. Often described as the brain of a computer, the processor is one of the most important components to look for in a laptop or any type of computer. Officially referred to as the CPU, or Central Processing Unit, the processor is basically what makes your computer tick. Whenever you do anything on your computer, the CPU is what makes your instructions happen. When it comes to editing a photo, a lot is happening in your computer. Data from your mouse and keyboard inputs have to be read and translated to on-screen feedback. Any changes you make to the image in your photo editing software have to be processed, which usually involves complex math, as well as reading and writing to your filesystem to save those changes as you go. The changes also have to be displayed on your screen. Basically, the CPU does most of the heavy lifting in your computer. The more powerful the CPU, the more responsive your computer will be, and the faster you will be able to edit your images. There are two main brands of processor, those made by Intel and those made by AMD. Processors come in a wide variety of specifications and speeds, and there are different types of processor for desktop and laptop computers. The main reason desktops have different processors to laptops is heat. The energy required by a CPU to do its work is given off in the form of heat, and higher-end desktop computers have room for larger fans that let them dissipate that heat. Laptops only have so much room for fans and heat dissipation, so laptop specific CPUs are lower power so that they don’t overheat. When it comes to processors, in our opinion, Intel currently produces the best processors for photo editing. Their naming convention leaves a little to be desired, but in general you will want to look for the following. As an example, an Intel processor may be labelled as an i7-8550U. Core version: The first two digits in the name refer to the core version. These are always marked with the letter “i” followed by a number. For example, i3, i5, i7 and i9. The higher the number, the faster the processor. For photo editing, we advise a Core i5 or higher. Processor generation: The processor generation relates to how new the processor is. Intel released its first generation processor in this naming convention in 2008. The first number after the hyphen is the generation, for example, the i7-8550U is an eighth generation processor. The 8th generation intel processors (8xxx) started to be released in 2017. 9th generation processors (9xxx) are scheduled to be released towards the end of 2019. For photo editing, we advise an 8th generation processor or higher. Processor speed: The three digits after the generation roughly refer to the speed of the processor. The higher the number, the more powerful the processor. For example, an i7-8550U is less powerful than an i7-8650U (bold for emphasis). For photo editing, we’d advise a 500 or higher processor number. Processor type: The final letter of the processor is very important for laptop processors especially, as it defines the product line. This will give you an idea of what the processor is designed for and thus its capabilities. A “U” for example is generally designed for ultraportable laptops, as it puts out less heat. The “U” stands for Ultra-low power. An “H” processor is a high performance unit, usually destined for larger high-end laptops with more room for cooling. The “H” stands for high performance graphics, although this is more of a relative term. A discrete graphics card will perform better for graphically intensive tasks, as explained shortly. There are also a number of other letters, including “Y” for “Extremely Low Power”. This is a fanless design, meaning it puts out minimum amounts of heat, but is also very low power. Intel also produces Celeron and Pentium chips, but these are very budget-minded processors, and we would advise against them if photo editing is a primary concern. For photo editing on a laptop, we’d advise at least a “U” category, and ideally an “H” category. The letters are not in order, just designations. Finally, you will also see talk of processor speeds and core counts. Generally, the higher the processor speed, the faster it will be. The higher the core count, the more it can achieve in parallel. However, it is usually easier to go by the specific model numbers, as these will tell you everything you need to know. The hard drive inside your laptop, also referred to as a hard disk or disk drive, is where all the data is stored. Normally this data is referred to as individual files. For example, a photo would be a file on the hard drive. Other types of files include word processing documents, program files (needed for operating system and programs to run), and music files. There are two main types of hard drive, solid state drives (SSDs) and mechanical hard drives, which are usually just referred to as hard drives or hard disk drives (HDDs). Mechanical hard drives are an older technology that involves fast spinning disk platters that are read by magnets. They have the advantage of being able to offer very high capacities for relatively low prices, and the disadvantage of being slower and more prone to failure. Solid state hard drives are more like flash memory cards. There are no moving parts, and so they are far less likely to fail. They are also much faster when it comes to reading and writing data. They are however more expensive. Hard drive capacity is measured in terms of bytes. The bigger the number, the more you can store on the drive. The numbers these days have gotten very large, so the number of bytes is often referred to in terms of Megabytes (a million bytes, or 1 MB), Gigabytes (1,000 MB) and Terabytes (1,000 GB). To give you an idea of what these mean, an average RAW image file is between 20 and 50 MB. So if you have 10,000 image files, you would need between 200 GB and 500 GB of storage space. SSD drives are usually between 128GB and 1024 GB, whilst mechanical hard drives are available from 512GB up to around 10TB. For photo editing, an SSD will make a huge difference. An average mechanical drive can read data at around 50 – 100 MB / second. That might sound fast, but an SSD can manage speeds from 500 MB to 2,700 MB / second! When a computer is editing photos, a lot of data gets read to and from the hard drive. To make your photo editing application, and operating system in general, more responsive and faster, we recommend getting a laptop with an SSD hard drive. We would recommend a minimum capacity of 256 GB for photo editing. Note that some laptops come with multiple hard drives, especially the gaming focused laptops. This is because games can take up a lot of space, and large SSDs are expensive. So to keep costs down, a gaming laptop will often come with a small SSD for the operating system and program files, and a larger slower mechanical hard drive for the game installation files. This slower drive can be useful for photographers as it provides additional photo storage space, and saves you having to carry an extra external hard drive around. RAM, which stands for Random Access Memory, is the other type of memory that your computer has. Whilst a hard drive is used for storage, and doesn’t lose its data when you turn the power off, RAM is volatile. This means that when you turn your computer off, the data in the RAM memory vanishes. So what is the point of RAM? Well, it’s incredibly fast. In the day-to-day operations of your computer, the RAM is where the processor stores the data it actually needs to use from moment to moment. So if you are editing an image file for example, the image file data will be read from the hard drive and stored in the RAM. RAM is really fast. Read and write speeds are in the region of 7500 MB/second. Of course, that speed comes at a cost, and RAM is much more expensive per gigabyte than either an SSD or hard drive. Modern laptops generally come with between 4GB and 16GB of RAM, with some higher end models configured with as much as 32GB of RAM. For photo editing, the bare minimum RAM you will want is 8GB. This is because when the computer is running, as well as the photo you are working on, you will also have the operating system and various programs taking up RAM. Whilst 8GB is going to be manageable, you will get better performance with 16GB (or more!). When the computer runs out of usable RAM, it has to spend precious time writing data out of the RAM and back to the hard drive. More memory means this will happen less frequently, and your computer will run quicker. You will have noticed this with your own computer – if you run too many programs at once, the computer might slow down. This is because the computer runs out of RAM, and has to spend time writing programs out of memory to the hard drive as it goes. This is also why a computer might seem faster when you start it up, as there is plenty of memory available. The graphics component of a computer is responsible for what appears on your computer’s screen. There are two main options for this: an integrated graphics card or a discrete graphics card. An integrated graphics card just means that your CPU is going to handle all the graphics tasks. For most users, this is fine. However, some applications can take advantage of a more powerful graphics card to accelerate certain tasks. And whilst playing games is usually the reason people want a discrete graphics card, modern photo editing applications can also take advantage of a discrete graphics card to accelerate certain functions. This can make a big difference to photo editing, so we would pick a laptop with a discrete graphics card if possible. These are usually manufactured by either nVidia or ATI/AMD. It is worth bearing in mind that a discrete graphics card uses more power, and will make the laptop more expensive. So whilst it is certainly useful, if portability, longevity and budget are key considerations, you might want to skip the discrete graphics card. It is certainly nice to have, and will improve performance, but it is not absolutely critical. Picking a screen size is important when it comes to photo editing. Laptops are available in a wide variety of screen sizes, generally falling between 11 inches and 17 inches. That measurement is taken diagonal, from bottom corner to the opposite top corner. While screen size is a personal preference, a larger screen can make editing a lot easier as you will get a clearer view of the image, and the various tools that you use in your photo editing application will be easier to access. On the flipside, a larger screen will require a larger and heavier laptop. We would suggest that a 13″ or 15″ laptop would be the ideal compromise between usability and portability for most users. If you plan to mainly work in one place, a larger screen size is nice to have, although you can also purchase an external monitor. As well as the physical size of the screen, screens will also have different resolutions. The screen resolution refers to how many physical pixels make up the screen. For example, a 1920 x 1080 pixel screen, also referred to as a high definition, or 1080p HD screen, will be 1920 pixels wide, and 1080 pixels high. In total, this is just over 2 million pixels. It’s also possible to get much higher resolution screens. These have the advantage in that the images will be sharper and clearer, and the disadvantage that the processor or graphics card will have to work harder. Higher resolution screens are also more battery intensive, and cost more. For a photo editing laptop, we’d recommend a minimum screen resolution of 1920 x 1080, or 1080p. 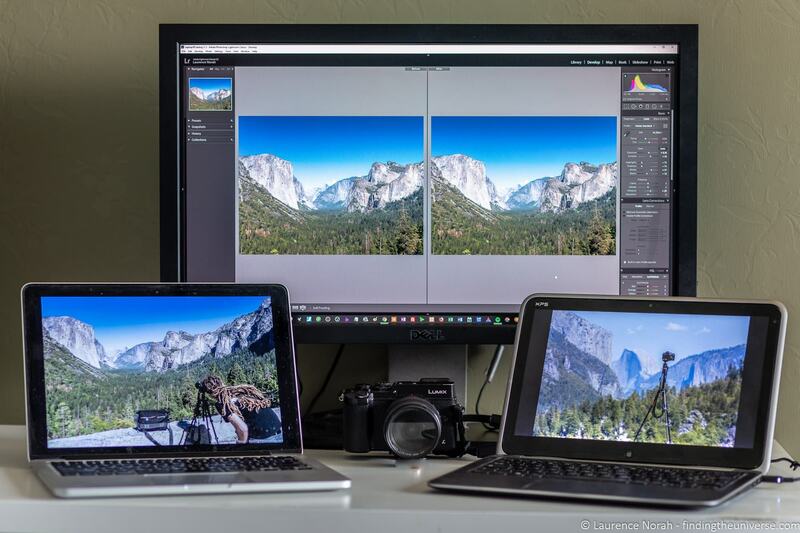 The technology that powers a screen also makes a difference when it comes to photo editing. There are a variety of screen panels available, including TN (twisting nematic), VA (vertical alignment), and IPS (in-plane switching). These are just different technologies that are used to display the pixels on the screen. TN is generally the cheapest, whilst IPS is more expensive. IPS is the option we highly recommend for photo editing. An IPS panel has greater viewing angles and the most accurate color rendition of the common screen types on the market. Having accurate colors on your screen is really important for photo editing, especially if you are selling your photos. Speaking of colors, a monitor also has what is known as a gamut. This refers to the range of colors that a monitor can display. You want to make sure that the range of colors you see on your computer screen will match what most other users are seeing, as well as what your camera is recording. For photography, you want a monitor that can display close to 100% of the sRGB color gamut. sRGB is the international standard used by the majority of cameras and computers out there. As a minimum, we’d recommend 90% sRGB coverage, although as with everything, sometimes a compromise has to be made. There are other features to consider when it comes to screens, including whether or not it supports touch input, which is useful for editing with a stylus, if that’s your thing. The weight and physical size of a laptop is very much up to you as the user, and what you think you will be doing with your laptop. If you will be moving it around a lot and having to carry it, then the weight and size will be more of a consideration. If it will mostly sit on a desk, with the odd foray to a sofa or coffee shop, then weight and size may be less important. Weight and size do tend to translate well to power. Physically larger laptops have more room for cooling fans and heatsinks, meaning they can fit higher powered components inside. Smaller laptops, also often referred to as ultrabooks, have to use lower powered components due to thermal restrictions. We’re moving into the final stretches of what to look for when it comes to a laptop, and again, many of these things come down to personal taste and preference rather than being essential for photo editing. However, you do need to consider some of these when comparing laptops to help you make a good decision. Ports are the various holes in the laptop that you can plug external devices into. Most common are USB posts on Windows based laptops and Thunderbolt ports on Apple laptops. Laptops may also come with other ports, including a headphone port, HDMI port, displayport, or SD card reader port so you can read your camera’s memory cards. It may be that you have a specific requirement for a type of port. For example, you might want to hook up an external monitor which requires a displayport or HDMI adaptor. Also, if you want to plugin in external keyboard, mice, or hard drives, you will need ports that match your devices. Generally, the smaller the laptop, the less ports it will have. When it comes to photo editing, we advise that having the ability to hook up an external mouse and hard drive can be very useful. Your choice of operating system will very much be a personal preference. The 3 major operating systems are Microsoft Windows, Apple MacOS, and Linux. For this article, we are primarily focusing on Windows and MacOS. For a long time, Apple was widely regarded as being the brand of choice when it came to digital editing for their superior hardware and software. However, over time, the hardware and software capabilities across Microsoft and Apple devices have pretty much reached feature parity in terms of speed, and there will not be a great difference in speed between operating systems on equally powered hardware for photo editing. Generally, Mac laptops are priced at a premium over comparable Windows devices, so you can usually get more value for your money with a Windows laptop. However, this is very much a personal preference and if you are used to an operating system, I would advise sticking with it rather than re-learning a whole new one. If you are a Linux user, I suspect that you already know what you are doing. Many of the recommended laptops will also of course support Linux, but it might not be supported out of the box or by the manufacturer. Now that you know what to look for, we’re going to list our favourite laptops for photographers. This list spans a range of types of laptop, from lighter portable options through to heavier and more high powered machines. Note that many of these laptops are available at different specification levels. We have recommended a price and specification that we think will work work for photo editing in most cases, although you can always upgrade or downgrade depending on your budget. It’s also important to remember that many manufacturers reuse the same naming in their laptops each year, and refresh the design and internals. So when shopping, make sure you are buying the latest model as it will have the latest technologies. The easiest way to check if a laptop is the latest model is look at the CPU model number. This is the part that changes most commonly from year to year. For example, the i7-8550U was a common high end ultrabook processor in 2018, whilst the refreshed 2019 version is the i7-8565U. It’s also worth being aware that there can be slight differences depending on the geographic region you are in. We have based our recommendations on models available in the USA. Other regions may have slightly different components and configurations for the same laptop models. We’ve ordered this list first by size, and then by price. Smaller laptops will suit those of you looking for more portability, whilst larger laptops will suit those of you looking for more power. Microsoft have released a number of laptops with the Surface branding over the years. The Surface Pro is for users who want a highly portable device that also offers capable performance. There are a number of variants of the Surface Pro 6 offering different specifications, from the cheapest model with an i5-8250U processor, 8GB RAM and 128GB SSD, up to the most expensive with an i7-8650U processor, 16GB of RAM and 1TB SSD. We’d suggest the sweet spot for price and performance would be the entry level i7-8650U option with 8GB RAM and 256GB storage. All versions come with a fairly small 12.3″ screen, but it has an impressive 2736 x 1824 resolution. The screen is also touch enabled, and with the Microsoft Surface Pen (sold separately), you can use the device like a graphics tablet. In fact, the Surface Pro is actually classified as a tablet, so to use it as a laptop you need to add in the Surface Pro cover. This is a snap in keyboard that costs extra, so bear this cost in mind when comparing laptops. Overall, the Surface Pro 6 is one of the most portable options for photography editing on the go. The small screen size, necessity to add in peripherals, limited ports, and lack of discrete graphics card are all factors against it, but if portability is one of your primary concerns, this should definitely be on your shortlist. You might be familiar with Huawei as a phone manufacturer, but they also make relatively affordable laptops that directly compete with the likes of Apple and Dell, usually at a slightly lower price. You still get premium design and specifications though. The MateBook X Pro is no exception. The configuration we recommend comes with an Intel Core i7-8550U, 16GB RAM, a 512GB SSD, and a dedicated discrete graphics card from nVidia. These are impressive specifications given the price. The 13.9″ IPS touchscreen display has an unusual 3:2 ratio (most laptops offer 16:9 displays), which gives you more vertical space for photo editing, especially compared to other 14″ laptops. Like many smaller laptops, it’s missing an SD card reader, but it does have a good selection of ports, including 1 Thunderbold, 3 USB-C, 1 USB C 3.1, 1 USB 3.0, and a 3.5mm headphone port. Note that a refreshed version of the Matebook X Pro with a more powerful processor is due to be released around May 2019, so if you are not in a hurry this might be worth waiting for. Huawei is a Chinese brand that is not well known in some countries such as the USA, so these laptops can be harder to find, and support may or may not be an issue if you have problems. I’ll be honest, I’ve loved Dell laptops for as long as I’ve been buying laptops, and I currently use an older Dell XPS as my go-to travel laptop. Jess’s first laptops were also made by Dell. The Dell XPS 13 is definitely one of the best ultraportable laptops on the market today. A variety of options are available, from a model with an i3-8145U processor, 4GB RAM and 128GB SSD, up to the high end version with an i7-8565U processor, 16GB RAM and 1TB SSD. Models are also differentiated by the screen, with either a 1080p screen or a high resolution 4K 3840 x 2160 pixel screen. We actually think the model at the higher end of the range offers great value for money for the Dell XPS 13 as you get fantastic specs, a lovely screen, and great performance in a relatively small and lightweight package. It is not without its weaknesses though. There’s no memory card reader, and it only comes with the newer USB-C port (although it does come with an adaptor for standard USB devices) and thunderbolt ports. It also doesn’t have discrete graphics. For that, you’ll want to look at it’s bigger brother, which is next in our list. Screen: 13″ 3840 x 2160 touchscreen with stylus support (stylus sold separately). 96.4% sRGB coverage. With a 14″ screen, the Lenova Thinkpad X1 Carbon sits between the higher end 15″+ laptops further on in our list and the more portable 13″ ultraportables. However, it is still remarkably lightweight given the larger screen. As always, a variety of configurations are on offer. We suggest the i7-8550U with 16GB of RAM, 512GB SSD and 15 inch 1920×1080 Full HD display as it is a good balance between price and performance. Of course, upgrades are available, including a higher resolution 2560 x 1440 screen, faster processor, and more storage. As this is an ultraportable rather than a high-end powerhouse, this laptop doesn’t have a discrete graphics card. Those of you who love the Thinkpad range but want a bit more power and screen real estate might consider the Lenovo Thinkpad X1 Extreme instead, which comes with a 15.6″ screen and the Intel H series processors, as well as the option for a discrete graphics processor. If you want a fast laptop but don’t want to pay an arm and a leg for it, one option is to throw the notion of portability out of the window. That will bring you to the more mainstream class of gaming laptops, where I suggest you take a close look at the Dell G7 15. This is a available in a variety of specifications, including a good budget option. Here though, we’re going to go for a more high end model. We recommend the version with the Core i7 8750H processor, 16GB of RAM, and 256GB SSD storage, which also comes with a 1TB mechanical hard drive. Being a gaming focused laptop, it also has a 6GB NVIDIA graphics card. The screen is a 15.6inch 1920 x 1080 IPS panel, so it’s not 4K. It also only covers 56% of the sRGB color gamut, which is definitely sub-optimal for photo editing. Weighing in at 6.31lbs, it’s not exactly lightweight. However it’s certainly good value for the specifications you get, although the sRGB coverage is a real concern with this one, and you might be better off looking at our budget options further on in the post instead. Lenovo’s Yoga laptops are great looking convertible laptops that flip between tablet mode and laptop mode. As well as that, the higher end 15″ model that we recommend for photo editing also has some serious muscle, including the option for a discrete graphics card, and up to a terabyte of SSD storage. 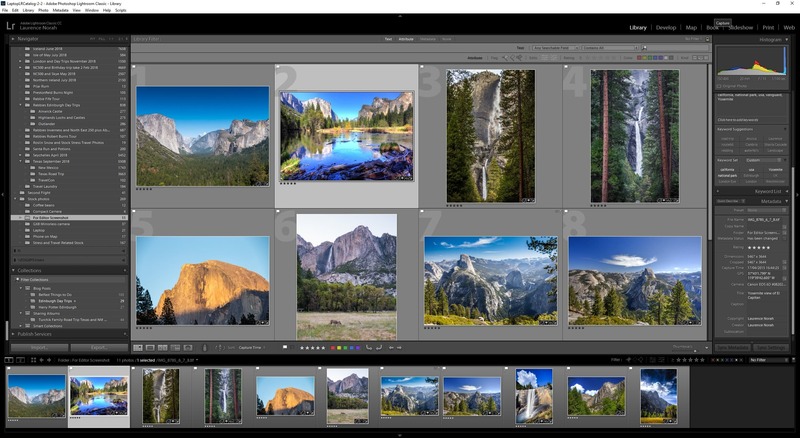 The 2019 configuration we recommend for photo editing includes an i7-8565U processor, 16GB RAM, 256GB SSD, discrete NVIDIA graphics, and a 4K 3840 x 2160 IPS display. You can also spend a bit less for a lower resolution screen, or spend a bit more and get an even faster graphics card and larger SSD. As this is a 15.6″ laptop, the weight is naturally going to be a bit more than laptops with smaller screens, but the versatility and power on offer do make up for that. The main downside is that at 90% sRGB coverage, other laptops in this category offer better color coverage. Screen: 15.6″ 3840 x 2160 touchscreen with stylus support (stylus sold separately). 90% sRGB coverage. The Razer Blade 15 laptop is primarily a gaming laptop. However, this is actually a good thing from a photography editing point of view, as what makes the laptop good for gaming (fast processor and fast dedicated graphics card), also make it ideal for photo editing. There are a variety of specifications of this laptop, but even the base model comes with a blazing fast core i7-8750H processor and a discrete NVIDIA graphics card, along with 16GB RAM and a 128GB SSD hard drive. There’s even a 1TB internal mechanical hard drive to save you carting around an external USB drive. The screen is a 15.6″ model which is an HD 1920 x 1080 non-touch display in the base model, but it can be upgraded to a 4K 3840 x 2160 touch screen, which offers a wider color gamut as well. That said, the 94% sRGB coverage in this model is certainly on par with competitors, and better than most gaming focused laptops. However the upgrade comes as a very steep price (over $1,000) as Razer require you to upgrade to a faster graphics card and larger storage to get the higher resolution display. This is likely because as this is a gaming laptop, a lesser graphics card would struggle at such high resolutions. If a 4K resolution is what you are after but the almost $3,000 asking price is too high, you might consider other options on our list. All that power and a sizeable monitor does add up, and this laptop weighs in at 4.5lbs. That is actually remarkably svelte for a powerful gaming laptop, but it’s definitely not as lightweight as some of the other options in our list. Given all the power available, this is a remarkably well priced machine, and you can upgrade most of the specifications to make it even more powerful. The Asus Zenbook Pro comes in a wide variety of configurations, but all of them offer excellent design and solid performance. For photo editing, we’ve chosen the UX550GE model, which offers a fast i7-8750H processor, a generous 512GB SSD, 16GB RAM, and a discrete 4GB NVIDIA graphics card that powers the 15.6″ 4K 3840 x 2160 touch display with stylus support. It doesn’t have any of the fancy convertible features of some other laptops on our list, but for raw power, it is very much near the top of the list for the price. 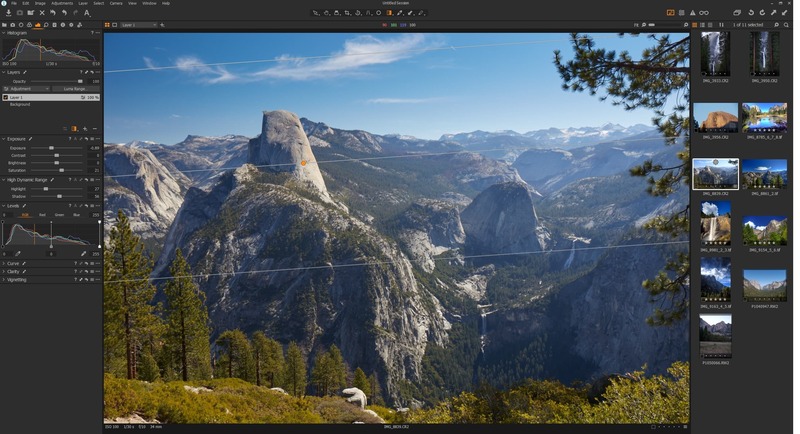 The screen also offers 99.8% sRGB coverage, making it one of the best in our round-up for photo editing. To be honest though, as long as it’s over 90% then you should be fine. However, if you are planning on printing your work for commercial use, then you will definitely want a screen that matches 100% of the sRGB, or even 100% of the Adobe RGB gamut, which contains even more colors. If professional printing is your goal, I would definitely suggest using a larger external monitor for photo editing. Screen: 15.6″ 3840 x 2160 touchscreen with stylus support. 99.8% sRGB coverage.